Every time I try to comment on this site; it says I need "50 reputation"; but as far as I can tell, you have to comment to get reputation. Did everyone who is currently commenting sign up and comment before this was required? Or is there some other method for getting reputation? If there is something I'm missing about the situation, the site does not cater to new users and show any way around this barrier. If you are going to require reputation to do things here; there should be a help button or something right next to the "you need rep" warning that explains how to get it. This is probably the 4th or 5th time I've stumbled on this site over the last year and I still can't find any way to do anything while I'm here, its very poorly explained and I can't imagine how many people give up on the site entirely after being frustrated by this. edit: beyond frustrating... even trying to post this question has required several attempts. I can't create tags without 300 reputation but a tag is required? And again no explanation with the warning on how to get reputation. I'm not even sure I want an answer at this point, this site is just stupidly designed and frustrating as hell to even attempt using. There is also a Help link at the bottom of every page. Just Ctrl+F for it. It is not rocket surgery. Honest! 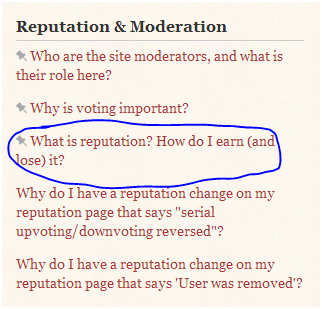 Here is the "What is reputation?" page. Did everyone who is currently commenting sign up and comment before this was required? 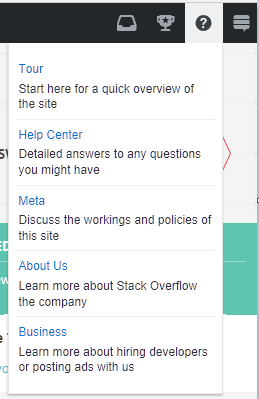 During the private beta of Stack Overflow, a lot of things required less reputation than they do today. But because of spam, the administrators introduced a reputation requirement. Or is there some other method for getting reputation? To get to 50 quickly, you can do one of two things, neither of which requires already having privileges at EL&U. There are two types of questions on a Stack Exchange site: clear ones and unclear ones. Giving a complete answer to a clear question does not need reputation. Only adding a comment to help the asker fix an unclear question needs reputation. So until you have 50 reputation, skip the unclear questions and find clear questions that lack an answer. Each upvote on a useful answer adds 10 reputation. One thing that makes this slightly more difficult on more active Stack Exchange sites is the "fastest gun in the west" problem, as a clear question may already have a decent answer by the time you get to it. If you sign up for multiple Stack Exchange sites with the same credentials, Stack Exchange will link those accounts. 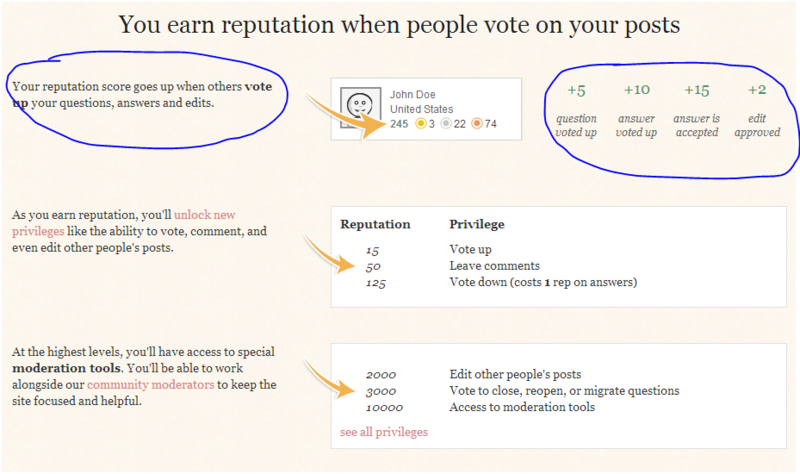 Once one of your accounts reaches 200 reputation, your linked accounts will earn a one-time association bonus of 100 additional reputation points. A Stack Exchange site proposal on Area 51 cannot become a beta site until at least 100 committers have the association bonus. This ensures that at least some users of a new site understand how the Stack Exchange web application works (#1 #2) and can help the asker fix unclear questions, as any user with the association bonus has enough reputation to comment unless he spends too much reputation on bounties. Other sites that may interest a new EL&U user include English Language Learners, Linguistics, Writers, and Worldbuilding. Ways to improve reputation that aren't asking or answering?